Well it 7:30am “day of “and I am still packing. I am absolutely amazed by the amount of stuff I have…don’t ever think living simply in a motor home precludes having an over abundance of stuff. Good Golly. I have been packing for days and am still not done. If I didn’t know better I’d say my stuff was multiplying behind my back when I wasn’t looking. I’d better get a move on. Stay tuned. 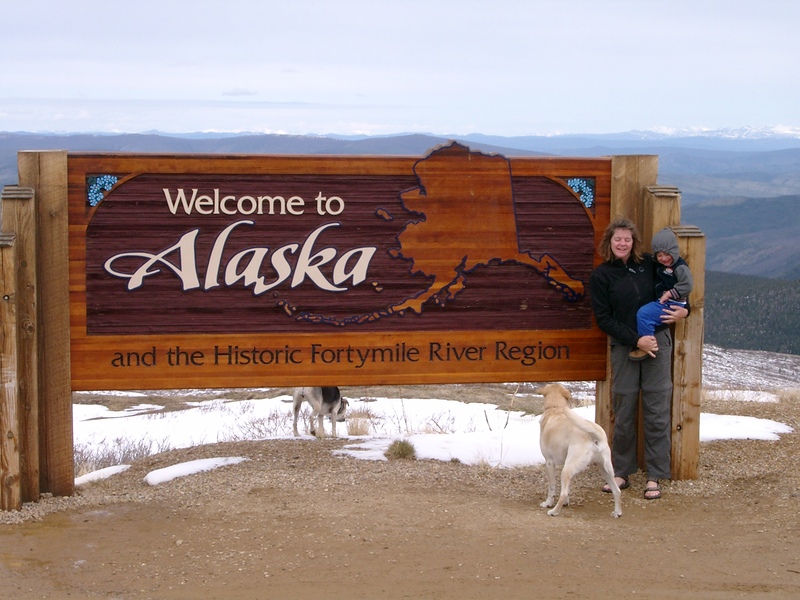 And Off We Go – 3,594 miles North To Alaska! This will be just a quick post since I’m still busy packing, winterizing, and saying goodbye to friends (one of which offered me a 90 minute massage today, so of course I’ll make time for that!). Gift certificates available – just in time for the Holidays!!! Also, I’ve been asked about the route I’ll be taking, so I’ve included it here. As usual, you can use the pan and zoom functions to your advantage, in fact, you really have to use them in order to see the entire route because its so long. Oops. More technical difficulties which I don’t have time to figure out at the moment, but if you click on all that mess below, you should get to the map. I’ve got an RV guy coming today to Winterize Dora since I don’t trust myself to do it properly and The Black Hole is currently at the fix-it shop getting the wiring corrected so the turn signals on the UHaul will function properly. First thing tomorrow morning, I’ll drop her, Dora, off at her Storage facility, grab Misty, Mosely, The Black Hole, and the UHaul and begin the 12 day, 3594 mile trek North To Alaska! Stay tuned for the adventures that are sure to come. 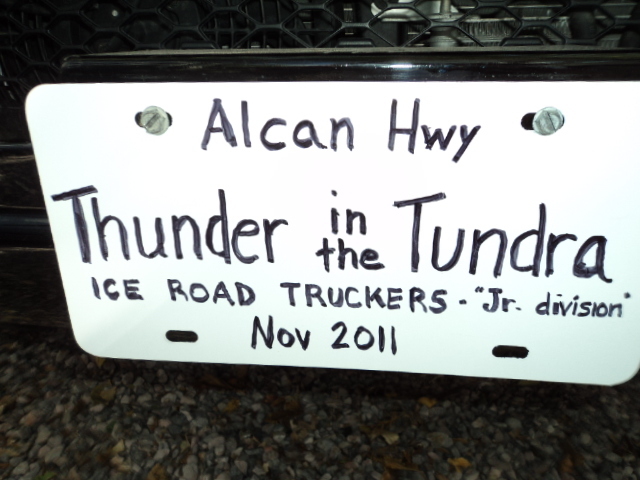 As you know, in preparation for my upcoming trip, I’ve been reading all about driving the Alcan in the winter and have learned tons. Among other things, most of the sites on this topic include some sort of a list of suggested/mandatory items. These items are commonly referred to as “Survival Gear”, but let’s not be dramatic. I’ve been running around town trying to cobble together all the items I don’t already own, which is proving to be an interesting feat since Arizona is not a big purveyor of winter “survival gear”, as you can imagine. One of the items on the list is lock De-Icer. Several of the sites suggested that it would be bad news indeed if I found myself unable to open my car due to frozen locks. They also suggested that this would, of course, occur when I was hundreds of miles from any sort of help or warmth and would surely freeze to death as a result. 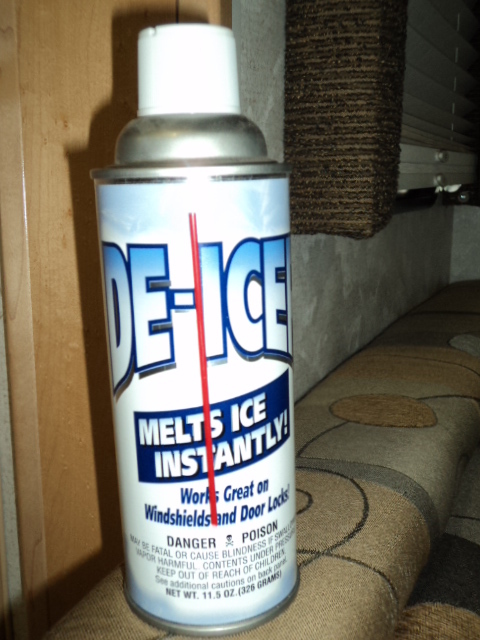 Given this dire possibility, I located and purchased a can of De-Icer and won’t leave home without it. But here’s the conundrum which occurred to me a few days ago. If I am unfortunate enough to find myself locked outside of my car in the minus 40 degree weather hundreds of miles from nowhere, won’t the De-Icer be locked inside my car behind the frozen locks? Or, if it’s not in the car wouldn’t it then be locked inside the UHaul trailer …also behind a frozen lock? Hmmmmmmm. It’s a mystery indeed, one which had me laughing out loud as I ran through the possibilities in my mind. What am I supposed to do…take the De-Icer with me when I leave the car? Or, strap it to the outside of the car, perhaps on the roof rack with the spare trailer tire? How ridiculous. Then I thought, why on earth would I get out of my car and lock it behind me if I’m hundreds of miles from nowhere in minus 40 degree weather. I mean, really. If any of you have any thoughts on this or are able to see what I must be unable to see, please let me know. I’m all ears. I’m off to have a block heater installed on The Black Hole. Before we begin, let’s everybody wish Frances a very Happy Birthday! I don’t know who I’ve told and who I haven’t about becoming a Couch Surfer, but I found myself composing an email to my family about it and thought, shoot, I may as well just tell everybody at the same time, so here we go…. Isn’t it fun? I’m on the move again and have lot’s to talk about! Since I’ll be driving up to AK in early winter, I can’t just pull over and spend the night wherever I want, so some pre-planning is necessary. Given this, I took some time the other day to sketch out a rough driving timeline, so I’d know where I’d be each night. This is especially important along the Alcan since you can’t simply pull into a hotel when you are tired of driving because there may well not be a hotel or an Inn or even a lean-to within 200 or more miles of where you are at that given moment. So, armed with my itinerary, I called Dawson Creek, British Columbia, which is Mile O of the Alcan Highway. I figured it’s going to take me 6 full days of driving to get there, and, it being the jumping off point, I’d stay for 2 nights in order to take a break, gather any last bits of advice, weather reports, and supplies I might need to get all of us and The Black Hole to Anchorage. Here’s what I found out: 1) The hotels in Dawson Creek (and along the rest of the Alcan) are either full or next to full for the dates I need due to all the Oil Workers, and 2) the rooms are $130.00- $160.00 per night at the more reasonably priced hotels. Yikes! I swallowed hard, put a second mortgage on my house, sold some stock, and began making reservations with a credit card that is still smokin’. Next stop, Fort Nelson. Same story. Next stop, Watson Lake. Same story. My brother Hill happened to be in Dora with me as all this was transpiring and he made a few suggestions which led me to Couch Surfing. In a nutshell, the very basics of Couch Surfing consist of millions of people over 230 some odd Countries either staying with people they don’t know or are hosting travelers they don’t know. Now Hill has been successfully Surfing couches and Hosting surfers for going on 4 years and he really thinks it’s a cool deal. He had told me about it on several prior occasions, but it just never clicked, that is, until now. He helped me see what an amazing opportunity it is, not just to save $, but more importantly to meet really neat local people as I travel north. Instead of arriving at yet another Super 8 or whatever the local equivalent is, I could be arriving at someone’s home who is interesting and who finds me interesting. How much better is that? It wasn’t long before I had joined, filled in my Profile, uploaded pictures, and began searching for available “couches” along my route. I sent out a handful of requests and have had two people accept. What this means is that for the two nights I’ll be in Dawson Creek, I’ll be staying with Brad and Courtney and for the night I’m in Watson Lake, I’ll be staying with another couple who kindly accepted my request. I’ve pasted Brad and Courtney’s reply to my request below. It feels so good to be anticipated with such enthusiasm. We would be delighted to have you stay with us. Your trip through the US sounds terrific; we’d love to swap stories of road trip travels. Courtney and I just finished a similar (although shorter) excursion across the western states. Courtney and I work in town, we are out of the house from about 8am-4pm. Our evenings are usually spent making supper (Courtney is a foodie and terrific cook), walking the dog, doing some house repairs and relaxing by the fire with a book. We have a guest bedroom that you are welcome to. Aurora will surely enjoy Misty and Mosely’s company. Unfortunately, our yard is not fenced-in but there are several fields nearby to let the dogs rip. Your visit is highly anticipated and we’ll be happy to share some time and local highlights with you! SO much better than a hotel, right? I wish this had clicked with me earlier, it would have been so much fun to Surf my way around the Country in Dora. Oh well, better late than never. Their tagline is , Participate in creating a better world, one couch at a time. On a side note, for those of you who wonder if I’m studying in the midst of all this buying of cars and trip planning, I am so happy to report that I am! I’ve gotten into a routine of studying for about 2 hours in the morning as soon as I get up and for another hour or so before I go to bed. As time allows, I can sometimes even get a bit more squeezed into the middle of the day. Thank goodness. It was a dark night near the banks of the Colorado River just over the Arizona-Nevada State line where Lil’ Pea was traded for The Black Hole. I was told to meet my contact in the parking lot of the Riverside Casino to finalize the deal. I was to come prepared and to wait for a signal. Upon arrival, I flashed my lights spying an open car trunk in the far corner of the lot and knew my contact had arrived ahead of me. We met under the cover of darkness, completed the necessary documents, nodded our good-byes and went our separate ways. The deal was done. I was glad to have it behind me and glad to know I wouldn’t have to think of it ever again. Unfortunately, this was not the case. These photos were delivered to me this morning in an unmarked envelope with a note asking for a certain amount of money, but instead of succumbing to blackmail, I am “outing” myself and the above mentioned deal. Hopefully, I can help others by bringing these sort of shenanigans to light. My wish is to continue telling tales and seeing the sights, but fear I may be incarcerated, or even killed as a result. Please keep me in your thoughts and prayers during this difficult time. How’s that for a little “Guy Noir” melodrama? Ha! Here’s the real story, which as you’ll see was not too far off from the one above. After lots of searching, I found a car that might be suitable for driving the Alcan in the winter while pulling a small trailer. It was located in Kingman, AZ, about 3.5 hours north and west of here. After much negotiation, I had a deal, so Hill and I drove Lil’ Pea up to Kingman to have the car looked at by a 3rd party mechanic and hopefully complete the transaction. All was going well until it was discovered I would be registering the car in Alaska. “Oh, that means we have to cross over into Nevada to do the deal to avoid the taxes”, I was told. So many hours later (why does it ALWAYS take hours at a car dealer, even when the transaction is agreed upon in advance??? 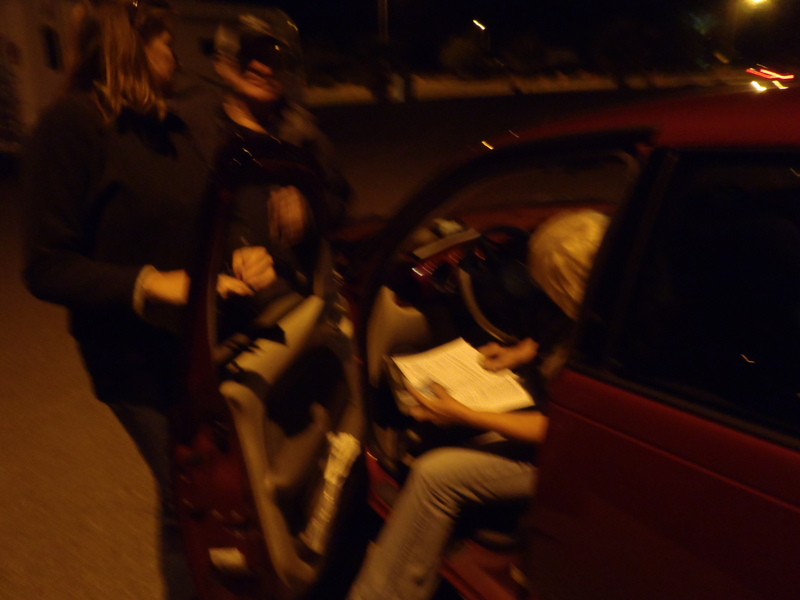 )It was after dark when Hill and I were told to follow the “driver” across the AZ-NV state line which was about 30 minutes away where we would meet a Notary in the parking lot of the Casino. She would complete the paperwork the ‘driver” had brought, I would sign where I was told to sign, and off we would go back to Cottonwood with my new (used) car. This whole thing made Hill and me laugh as we had never experienced such a thing…crossing state lines in the dark to meet someone in a parking lot with their trunk open as a signal…too funny. We felt like we may as well be doing some sort of a drug deal or something. Meet The Black Hole. 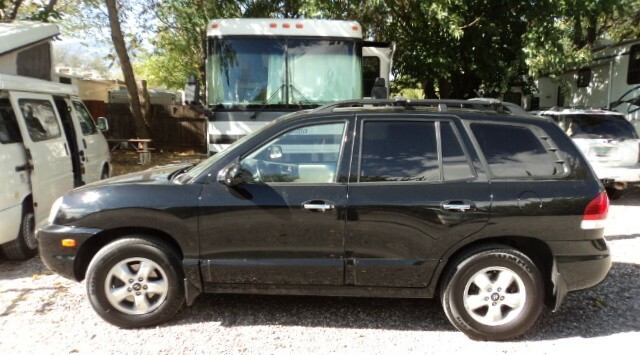 A 2006 Hyundai Sante Fe with only 34,000 miles, AWD, new tires, a trailer hitch, and heated -leather seats. We made it home with the new car around midnight last night and it didn’t take 24 hours for it to get its name and a new front license tag. I started calling it The Black Hole because of the inexplicable 1″ hole in its rear bumper and of course because of its color. Unbeknownst to me, Hill added the tag early this morning showing off his wonderful sense of humor with an eye toward my upcoming road travel. That’s it for now. Life is moving pretty fast at the moment, so I got to git. 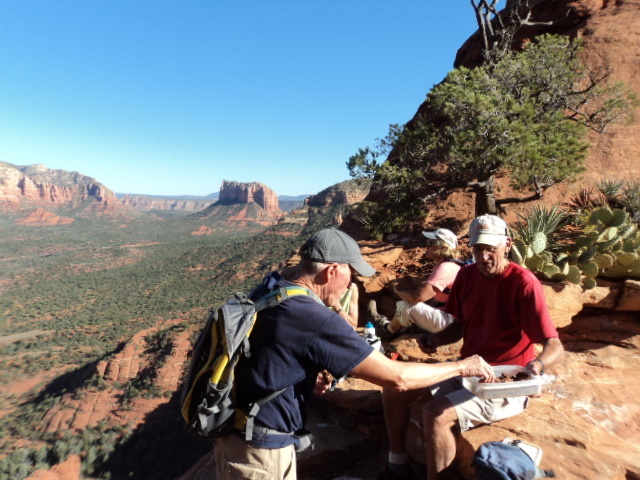 OK. To set the stage, my initial plan upon graduation was to stay here in AZ for the winter dividing my time fairly equally between giving massages, hiking in Sedona, taking continuing ed classes, and generally just enjoying the sunshine. Well, it seems there is another plan. As I shared with a few of you, immediately upon graduation, the thought of staying here in AZ wasn’t sitting right with me. It had come to feel more like biding time, which I’m sure we will all agree is a most dissatisfactory feeling. But what else should I do, I wondered. I thought of traveling the southwest with my mobile massage business, but that didn’t sit right either. The idea of returning to AK early flitted across my mind for about a nano second before it was quickly dismissed as crackpot. I mean, who chooses a dark, cold, winter in Alaska over a sunny and warm winter in the Southwest? Plus, the logistics of getting there at this time of year are a bit interesting so say the least, but the more I thought about what to do, the more it became clear that my “Walkabout” is over. Done. Complete. Fini. Whatever I set out to do is done. It’s time to go home. I must say, this realization made me smile from ear to ear, even in my heart. OK, so it’s time to go home. What’s that going to look like and how on earth is that going to happen? My National Board Exam is scheduled for November 17th, so I can’t leave until after that, which means driving over 3,500 miles up through the Northern United States, Alberta, British Columbia, Yukon Territories, and entering Alaska not too far from the Arctic Circle (relatively speaking) before heading south to Anchorage…at the end of November. Hmmmmm, I don’t know about you, but the idea of driving Dora with Lil’ Pea in tow along that route at that time of year gave me pause. Plus, let’s see…my house is rented so I have no place to live and oh yeah, my “job” isn’t expecting me til May. Fast forward exactly 48 hours from the “your walkabout is over and it’s time to go home” announcement and here I sit with a job waiting for me and a place to live. Amazing. When I called my friend Carol, who owns the Clinic where I will be working to find out if there is any chance she could use me 6 months early, she said she had just been thinking she should call me to see if I could come early since she was just thinking she was going to need to hire someone to fill in. Also, the efficiency apartment she has put together in the bottom of her house is now vacant and she kindly offered it to me. How ‘bout that? So, the only thing left is to try to figure out how I’m going to get Misty, Mosely, Me, and my meager belongings up there safely. Do I drive Dora? Yikes! Do I sell her? Do I store her and come back for her later? At the moment and after a bit of research, I’ve decided not to drive Dora unless I can hook up with a caravan of Winnebagos heading that way for delivery from Minnesota. I learned they make their last runs by the end of November and don’t start up again til late March. I should know more about this tomorrow. I also learned that the RV resale market in the Lower 48 is awful, but the market in AK is still good, so I’ll store her here til the Spring, sell Lil’ Pea, buy a car with AWD or 4WD, pack and arrange to ship my stuff North, study for my exam, take my Exam, pack the car with winter survival gear for myself and the dogs (they say at that time of year its best to be prepared to spend up to several nights in your car in temps that could dip to -40. Of course the chances of that happening in late November aren’t nearly as likely as it happening if I were to travel up there in January/February), and head out on the 18th/19th. What an adventure. I have a feeling that trip will make for some great stories. By the way, it will work out perfectly to store Dora here, since my sister and Carol were going to come to Sedona the first week of April for some mountain biking. If the storage idea pans out, then we can just all fly in together, still stay in Dora, still enjoy a week of sunny, warm, mountain biking, and then I can drive her North under far more civilized conditions. Lovely. That’s it for now. I’ll keep you posted as to how things unfold from here, so stay tuned. 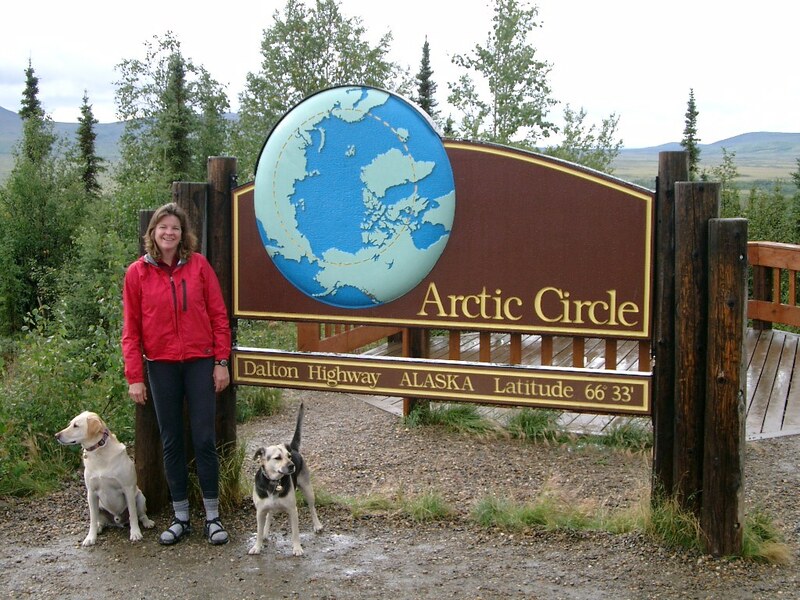 Here we are in May 2003 entering Alaska via the Top Of The World Highway. It seems some habits never die. We may think we licked them ages ago, but no, they lie patiently dormant, just waiting for an opportunity to arise and worm their way back into our lives. As if this isn’t frustrating enough, they never reappear in our lives in a subtle, maybe we can ignore them and they’ll go away sort of way, but always in a smug and completely irritating, AH HA! I still gottcha sort of way. Whatever. So, having set the stage, I’ll just go ahead and admit that one of my many bad habits of old has reared its ugly head after laying in wait for over 25 years. Yes, ladies and gentlemen, it turns out, I STILL HATE TO STUDY. What’s more, it seems I’ll still do ANYTHING to keep from studying. This is quite inconvenient too what with The National Board Exam looming in the not so distant future. 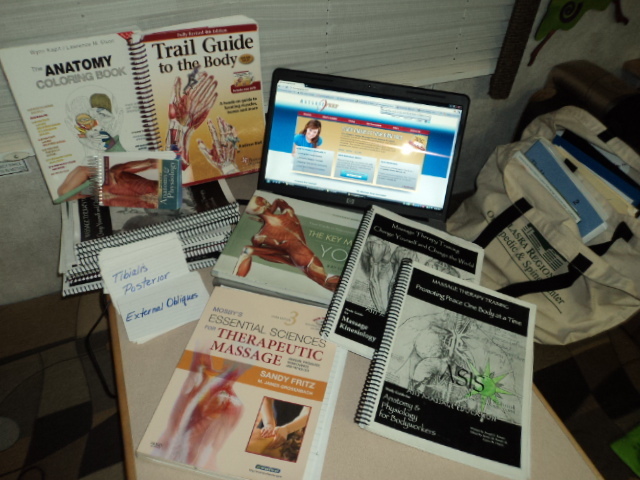 You’d think I’d be all buckled down with my books, flashcards, online Prep classes, etc. Alas, not so much, even though I have everything organized, set and ready as evidenced below. I even planned out a bit of a schedule for studying, 2-3 hours in the morning and 1-2 in the evening, leaving me plenty of time during the day to do massage, play, run errands, or whatever. Sounds reasonable right? Well, reasonable or not, I stuck to said schedule for exactly one half of one day. Impressive, I know. People who know me know that I’ll do anything to keep from cleaning house, including things like going to the dentist for a root canal. It’s absolutely true about me throwing a dinner party from time to time just to create a situation where I will have to clean my house because it has gotten so bad even I can’t stand it any longer. You get the idea, so you’ll appreciate the situation when you learn that I now find myself cleaning house to keep from studying. Oh boy, am I in trouble or what? Even as I type this, I realize I am posting to my blog so I can put off studying. After this, I think I’m going to email my friend Sue, who is interested in my upcoming Seminars in LA and then I was thinking the dogs need a bath and the yard could stand to be raked and Dora could use a waxing, and the neighbor’s fence could be stained, and, and, and. There is no end to how creative I can get coming up with activities that will keep me from studying. 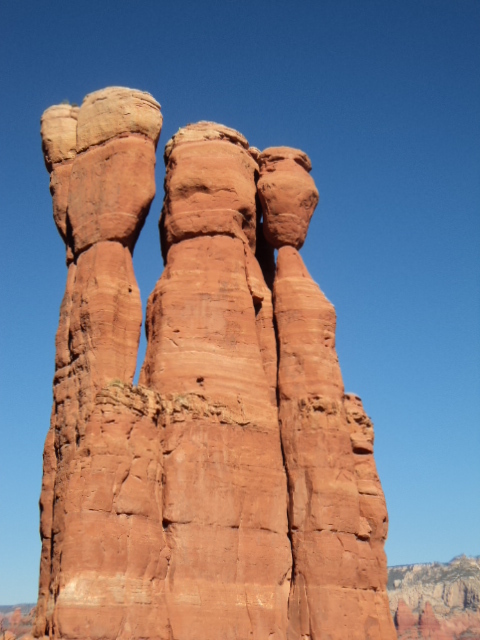 In fact, just yesterday, I was up in Sedona rooting around in the Red Rocks looking for something to occupy my time and energy when I fell upon a grand idea. And for some perspective. The crossing of the red rocks above is the same as below at the top of the gap on the upper left. Just kidding, that’s not me. 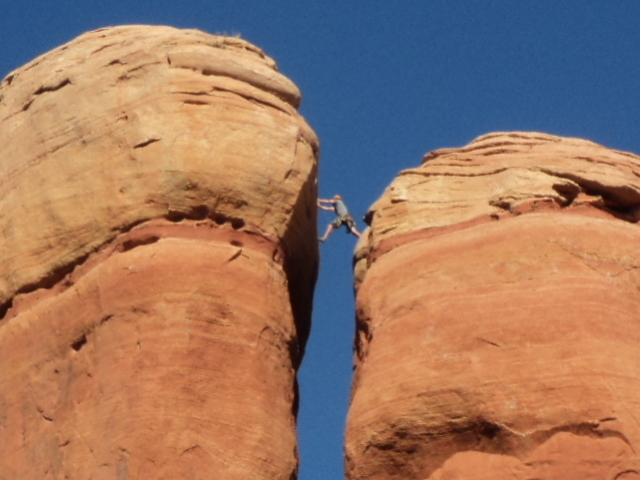 I was out and about on a hike with the Sedona Westerners and we happened to catch some rock climbers making their “bid for the summit” of the final pillar. Awesome. On their way back down, this one guy jumped from the upper platform to the lower. Crazy stuff. Here’s our group taking a break from our highest vantage point. That’s Bob, the leader for the day, handing out cookies he had made. These were chocolate with walnuts. The last time I went on one of his hikes, he had made macaroons. Yum. Yum. And here’s a view from the trail further down. 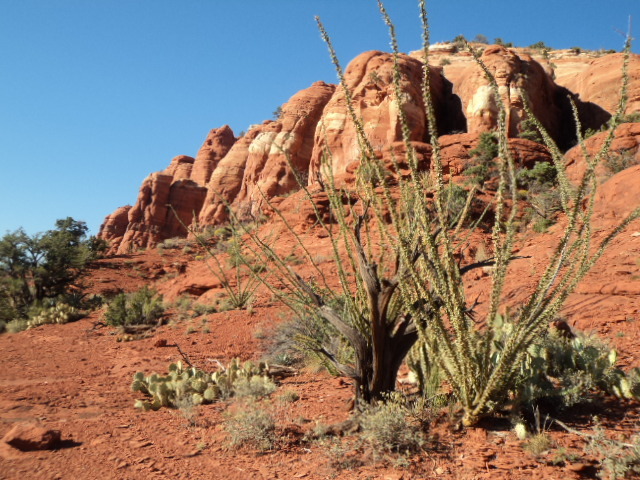 That plant with the long, wavy arms is an Ocotillo in full leaf. That’s it for now. I’ve got to meet a friend in a few hours. Who wants to make a bet as to the activity that will occupy my time til then? Only time will tell, so stay tuned.